Ever since Leo Esteban sold his car in 1994 to come to the United States to learn English, he has worked to prove himself here, both personally and professionally. Born in Venezuela into a family of industry—his father owned factories there—he attended Universidad José María Vargas to get an industrial engineering degree but soon realized he wanted to keep learning. Plus, “my dad used to tell me, ‘If you are an engineer and you don’t speak English, you are not an engineer,’” Esteban says. So, he gave up his wheels and most of his other possessions to attend three blocks of ESL classes at the University of North Carolina–Charlotte, and not long afterward, he made the move from engineering to the world of supply-chain management. 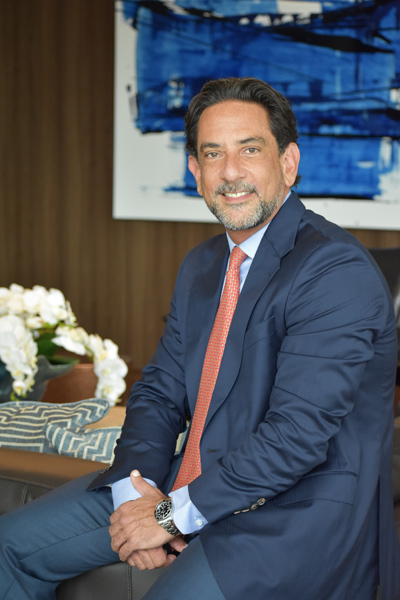 His first job was with a Mexican building-materials company, Cemex, that had just acquired operations in Venezuela, and he spent the first years of his career in its Venezuelan and Cuban offices before it acquired a business in the US and sent Esteban there as part of a special task force. He was supposed to be there for just three weeks, in 2000, to align the new operation with the Cemex culture and help with post-merger integration, but he wound up staying. Seventeen years later, after a couple of tough breaks with other companies and a lot of extra work to gain his citizenship and climb the corporate ladder, Esteban is the director of procurement for Veolia. It’s an environmental company that, until he arrived, had no standardized, centralized supply-chain strategies. He has helped consolidate its procurement operations, and in so doing, has been able to make a greater argument for the value of supply-chain work in general. He earned his citizenship and was set to graduate in 2010, but six months before he got the opportunity to walk across the stage at Rice to accept his degree, Cemex went through a company-wide restructuring, which resulted in the loss of his job. The building-materials firm was suffering directly from the plummeting of the housing market at the time, so “pretty much they dissolved most of the supply-chain organization,” Esteban says. Luckily, he had managed to make a connection with another Venezuelan at Rice who was able to get him an interview for supply-chain work at BP, but soon after he landed a job there, his employment was once again in jeopardy. After being forced to pay at least $70 billion in damages for the Deepwater Horizon oil spill, BP, too, set about eliminating departments, including most of its supply-chain infrastructure. “Supply-chain organizations tend to disappear in the first or second wave because we are a cost center, not a profit center, so companies try to survive without us,” Esteban says. It wasn’t until Esteban arrived at Veolia in 2015 that he was able to make a true case for supply-chain work. The growing company handles a diverse range of environmental-remediation, recycling, waste-management, and water-conservation projects, and a big part of the reason it hired Esteban in the first place was because it didn’t yet have a centralized supply-chain infrastructure. “They needed to implement it to start reducing costs and be more efficient,” he says. Esteban and the rest of the supply-chain team centralized Veolia’s procurement processes by standardizing them, taking the company from roughly 150 types of purchase agreements to just a few that were preapproved by in-house counsel. The measure drastically reduced Veolia’s legal fees and even helped get the company special pricing and sounder deals from preferred vendors it was making more purchases with. “If you’re talking to a vendor in 150 different ways, you’re confusing them, and you cannot add value that way,” Esteban says.